As I wrote before I didn’t know what to expect when I board the flight to India. I had an open mind, knowing that the trip would be a different experience. But nothing could have prepared me for what I witnessed. Like Dante Alighieri once wrote: 'Through me you go to the grief wracked city; Through me you go to everlasting pain; Through me you go a pass among lost souls... Surrender as you enter, every hope you have.' Welcome to Agra! After leaving Mumbai, we flew Jet Airways to Delhi. It was a wonderful flight on a brand new 737, where a typical Indian lunch was served by pleasant flight attendants. We spent a night in Delhi before boarding the early morning train to Agra, the city where the Taj Mahal is located. We booked our tour with Easy Tours of India, a travel agency specialized in personalized tours and we couldn’t ask for a better service. We were treated like royalty during the whole trip. First, I would like to say how sweet and kind the Indian people is. Even under the worse circumstances they keep a smile on their faces. After leaving the station we checked in in our hotel Oberoi Amarvillas - one of the five best hotels in the world - where from every room you can see the Taj Mahal, yes, spectacular, indeed. Then we visited the Agra Fort, an amazing monument, and then we visited the Little Taj. To get to this UNESCO World Heritage site we had to drive through the city of Agra and then I saw the unthinkable. 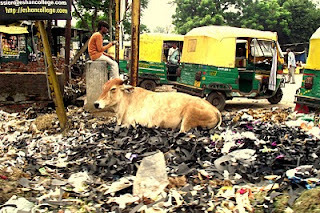 A city in total chaos, with people, monkeys, camels, cows, buffalos, dogs, goats, cars… running amok among huge amounts of trash and dust. I had a feeling that it was a scene out of a post apocalyptic movie happening right before my eyes! “The worst part is also the most interesting” told me the guide. By the time we arrived at the Taj Mahal, after dealing with hundreds of beggars at the entrance of the monument, everything that I had seen earlier overshadowed my Taj Mahal experience but still, it is an amazing monument… surrounded by misery and human degradation. Described as "a tear drop on the cheek of time" by Robindranath Tagore, Taj Mahal is poetry in stone. For centuries, the Taj Mahal has inspired poets, painters and musicians to try and capture its elusive magic in word, color and song. It is one of the most flawless architectural creations of the world. Since the 17th century, travelers have crossed continents to come and see this ultimate memorial to love, and few have been unmoved by its incomparable beauty. This is a travel blog and I’m not here to judge, but just to estate what I saw and felt during my visit to Agra. If you are looking for a relaxing vacation, India is not your destination. India is an intense experience that will affect you in more ways than you can imagine. Next stop, Jaipur, the Pink City.